Today tenant leaders along with members of the Housing Justice League delivered a letter to HUD’s regional office in Atlanta in protest of potential cuts to the HUD budget. Atlanta is already in the grip of a historic affordable housing crisis and we must oppose the $7.4 billion in budget cuts to the U.S. Department of Housing & Urban Development (HUD) proposed by President Trump and supported by Secretary Carson. 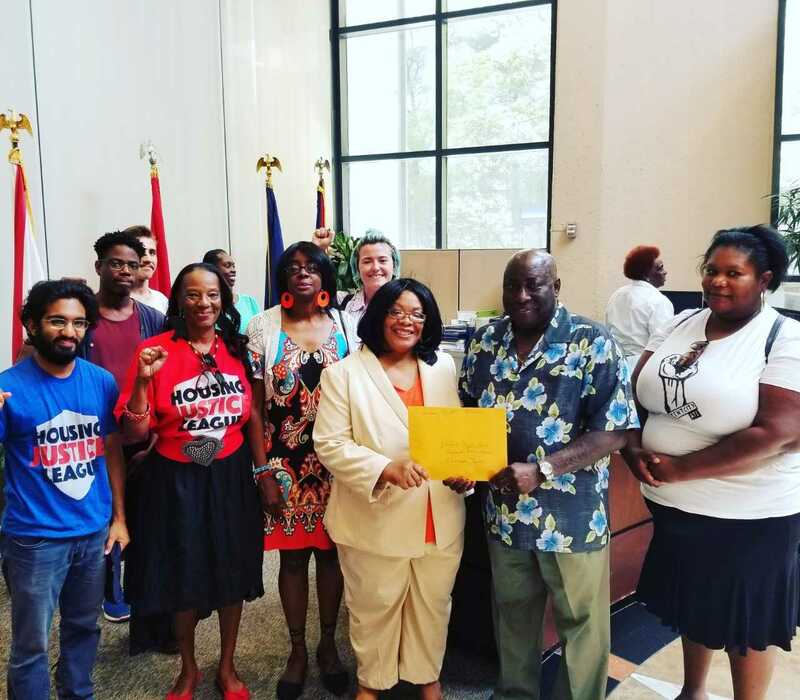 If the cuts pass, Miami will be at-risk of losing nearly $24 million each year for housing assistance, and thousands of Miami residents who are currently in HUD-subsidized housing will be in jeopardy of becoming homeless. Half of all renters in America are cost burdened, paying over 30 percent of their income to housing. This is over 21 million renter households. One in four of these pay over half of their income to housing, leaving no money left over for basic needs like food or childcare. We must expand, not reduce, federal funding for proven HUD programs. A safe and affordable place to live is a fundamental human right, and where we live has a direct, concrete impact on the opportunities that are available to ourselves and our children. To change this injustice, we will need the power of people coming together through organizing in local places all across America. We will need to use communities’ organizing power to hold government accountable at the local, state and national levels. Good and just public policy can only be developed with the direct input and experiences of those impacted the most by that policy. 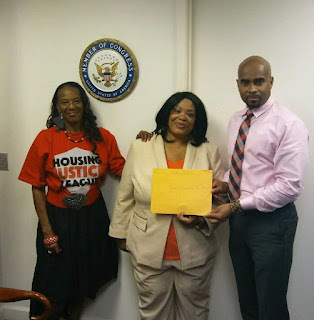 After we delivered the letter to HUD's regional office headed to Representative John Lewis’ office office which is right around the corner from HUD. Congressman Lewis is one of many who has oversight over HUD’s budget. Today’s action was part of a national effort to prevent cuts to the already underfunded HUD. 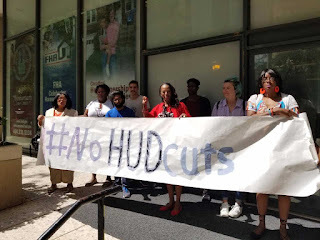 You can see what actions other cities took by checking out hashtags #NoHUDcuts and #NoCuts on twitter, Instagram, and facebook.